14: Fill out the Campaign Time line, including days/months of the year. Here I fill out the base time line sheet, starting day, and writing down the months of the year and days of the week taken from step 13. 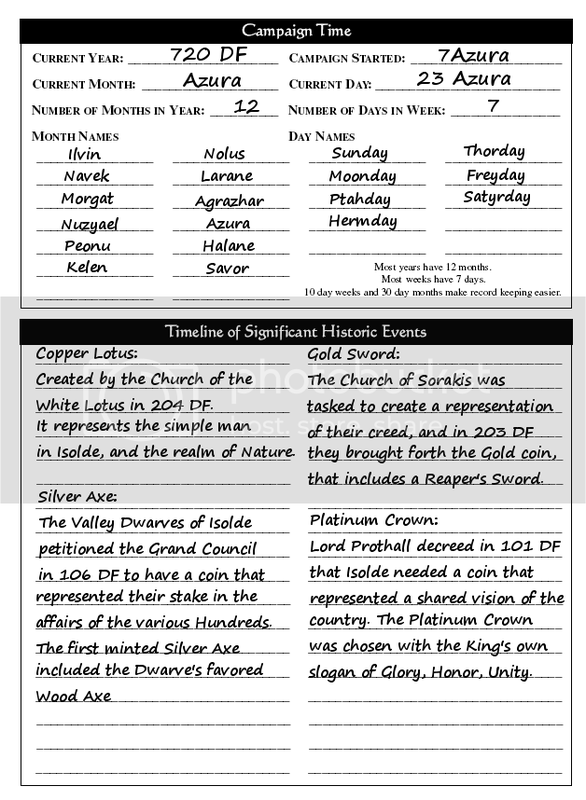 The bottom section of this sheet I used to give origin dates for the coins of the realms, and their creators with a bit of info. At this point I'm not worried about massive amounts of details, just trying to cover all my essential bases so that the world has a solid foundation. Later on I can go back and add in more details for various events during the gaming session. I wanted ease of use over some detailed design, something that the players "could" use if they wished, and decided that 4 large points of interest in the map design process would fuel each coin's history. Hence, the Church of Sorakis claimed the Gold Sword, the Valley Dwarves the Silver Axe, the Monastery the Copper Lotus, and the Royal Family the Platinum Crown. Once I decided on a design for each "head", I wanted Latin to be central on the coins, yet hidden under the guise of a Harnic Rune. Lastly I pondered what to use on the "tail" or reverse side of each coin. I could have 4 individual designs, front and back, but once I took another look at the Giant Trees at Grand Lynn, it was an easy choice to include a simple Grove of Trees as a single point of continuity for all the coins.